Harvard Business School, Boston, Massachusetts, Stati Uniti. Bloodless war and the scent of the Enlightenment: Il Caffè between politics and international trade in Austrian Lombardy. The historiography of political economy is currently undergoing a cultural turn, as abstract histories of economics on the model of Joseph A. Schumpeter’s History of Economic Analysis give way to more nuanced studies of economic ideas in their specific historical contexts. 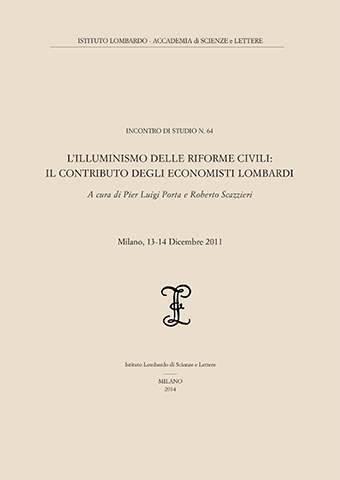 My essay contributes to this historiographical movement by contextualizing the economic theories and policies formulated by the members of the Accademia dei pugni in Austrian Lombardy in the 1760s and 70s. Particularly, it focuses on the practical exigencies of their Lombard context and the respective pulls of their disparate and sometimes conflicting patriotisms, whether religious, cultural, political, or economic. Austrian models of economic reform such as Philipp Ludwig Wenzel von Sinzendorf’s plan for an economic recovery influenced Milanese reformers much like a the reception of French, Spanish, and British economic ideas did, and the unique institutional context in which political economists such as Pietro Verri, Cesare Beccaria, and Sebastiano Franci operated goes a long way towards explaining their seemingly idiosyncratic contribution to the discipline, at once aware of how freer international trade was revolutionizing the world and eminently sensitive to the need for an active economic policy of tariffs and prohibitions to safeguard Lombardy in an age of ruthless economic competition. Though the Accademia dei pugni historiographically has been considered an incubator of both ‘mercantilism’ and ‘economic liberalism’, a more careful contextualization of the group’s work unveils a coherent political economy that, though hard to fit into historical stereotypes, was not simply torn between theory and practice, ‘laissezfaire’ and ‘protectionism’. In effect, they made one of the greatest contributions to political economy of their time.